James Featherstone is studying Civil & Stuctural Engineering and is doing his summer placement at Network Rail, working on the Farnworth Tunnel project. I am based full-time on site at Farnworth Tunnel, a tunnel widening project as part of the wider Northern Hub electrification works which Network Rail have undertaken. The project is truly one of a kind and brings with it challenges which are new to experienced engineers and myself alike. The site originally had two listed Victorian tunnels, built in the 1830s and 1880s. In order to be electrified, one tunnel needed to be enlarged. The two tunnels had tracks running in each direction (known as ‘up’ and ‘down’ in the railway industry). Running over the top of the tunnels is a busy motorway (the A666) and the railway service was required to be kept running while works were done. Literally millimetres of deflection in the soil, structures or temporary works could result in closure of the railway and motorway, and worst case scenario could mean a catastrophic failure. Huge levels of risk management, mitigation methods and planning have gone into the project. This includes using steel reinforced spray concrete to strengthen the smaller tunnel while the larger tunnel is bored, grouting the soil to fill any voids, and filling the larger tunnel with 7000m3 of foam concrete to then be dug out and provide structural integrity ahead of the bore. 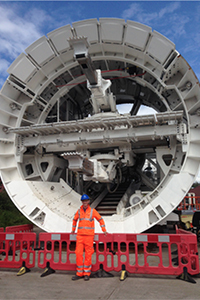 The most exciting part of the project personally has been seeing the 9m diameter, bespoke tunnelling machine designed and built locally specifically for the project. It is the largest tunnelling machine ever built in the UK and uses very simple civil engineering principles on a massive scale. When I finish my placement, the 270m long bore should be nearing completion, resulting in one of the two tunnels being able to take two electrified lines side by side and the other original tunnel keeping its smaller profile to be used for maintenance and access. My summer placement has been extremely rewarding so far – I’m working with engineers, construction managers, project managers, contractors, sub contractors, manufacturers and specialists all on one project in one team. I’ve further expanded my knowledge of how civil engineering projects actually work beyond the classroom/labs and have learnt how applicable my studies are.